With Christmas being the most popular holiday in the U.S. and one of the most expensive – Americans plan to spend up to $682 billion over the holiday season this year – the personal-finance website WalletHub today released its report on 2017’s Best Places for Christmas Celebrations. To help Americans celebrate Christmas without breaking the bank, WalletHub compared the 100 biggest cities across 29 key metrics. The data set ranges from Christmas events per capita to average price per Christmas party ticket to shopping centers and outlets per capita. Durham, North Carolina, has the lowest average price for a Christmas party ticket, $8.27, which is six times lower than in Las Vegas, the city with the highest at $49.99. San Francisco has the most Christmas events (per square root of the population), 0.038, which is 38 times more than in Tucson, Arizona, the city with the fewest at 0.001. Miami has the most Christmas tree farms (per square root of the population), 0.024, which is 24 times more than in Fort Worth, Texas, the city with the fewest at 0.001. San Francisco, California, has the most gift shops (per square root of the population), 0.209, which is 104.5 times more than in Garland, Texas, the city with the fewest at 0.002. New York has the most toy stores (per square root of the population), 0.145, which is 72.5 times more than in Detroit, the city with the fewest at 0.002. From indoor snowfalls to a 60-foot-tall glass Christmas tree to 12 miles of dazzling lights, every year Gaylord National Resort & Convention Center is transformed into the Washington, D.C. region’s “Capital of Christmas.” The sixth annual Christmas on the Potomac is a 52-day celebration running from November 15 through January 5 at Gaylord National Resort in National Harbor, Maryland (just eight miles south of Washington, D.C.). Marvel at the hotel’s largest, award-winning indoor attraction, ICE! featuring a brand-new theme, ‘Twas the Night Before Christmas. Hand-carved from more than two million pounds of colorful ice (all kept at a frigid 9 degrees), Clement Moore’s classic American holiday poem is brought to life in an icy wonderland. The attraction includes beloved scenes such as Ma in her kerchief, Pa in his cap, visions of Sugar Plums, and Saint Nick with his eight reindeer – all hand-carved into life-size ice sculptures. Children and adults alike thrill going down the 20-foot-tall ice slides. New this year: “Christmas in New York City,” bringing to life the iconic sights and sounds of the Big Apple at Christmastime, and featuring the tallest ice sculptures ever created at ICE! ICE! is open daily and can be accessed at its new location, connected to the resort and entered from inside the hotel’s 19-story atrium. Tickets start at $27 for adults ages 12 and older, $19 for children ages 3 to 11 and free for kids ages 2 and younger. For the ultimate ICE! experience, overnight guests at the hotel who book the “Christmas on the Potomac” Hotel Package receive unlimited admission to the attraction available at any time during daily operating hours throughout their stay. The package also includes one-night accommodations, a souvenir photo and $100 resort credit that can be used on-site toward dining, seasonal spa treatments, Gingy’s Gingerbread Decorating and additional activities. The package is available for select dates from November 15 through January 5 and starts at $269** for two guests. To make a reservation, call 301-965-4000 or book online at www.ChristmasOnThePotomac.com. Also, each night, from 5 to 9 pm, there are four free Holiday Fountain Shows and Nightly Indoor Snowfalls. These feature a narration of the classic Christmas story during the Brightest Star Fountain Show, or both modern and classical Christmas carols during the Sounds & Songs of Christmas Show. Each show also features an indoor snowfall within the 72 degree atrium. 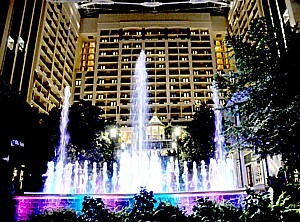 Gaylord National Resort and Convention Center is the largest, non-gaming hotel and convention center on the Eastern Coast, located along the banks of the Potomac River in National Harbor, Maryland. Opened in April 2008 and only eight miles from Washington, D.C., the AAA-Four Diamond resort offers 2,000 rooms including 110 suites; a 19-story atrium; 470,000 square-feet of convention space; acclaimed restaurants including Old Hickory Steakhouse; a modern resort spa, Relache Spa and Salon; and Pose Rooftop Lounge. For additional information on Christmas on the Potomac and its offerings, visit www.ChristmasOnThePotomac.com or call 301-965-4000.